Sidney Slon/Pipe Dream Photographer Dickinson Community Players (DCP) presented “Next to Normal,” an emotional and poignant musical about mental health and its impact on family dynamics. On Friday, April 12, students and community members packed into Chenango Champlain Collegiate Center’s Multipurpose Room to watch Dickinson Community Players (DCP) open its rendition of “Next to Normal,” a musical about tragedy, mental illness and a family that manages to love one another in spite of the pain surrounding them. “Next to Normal” follows the Goodman family through the trials inherent in treating severe mental illness as wife and mother Diana suffers from continuous delusions due to her worsening bipolar disorder. Although her son Gabriel died when he was an infant, she has constant visions of him as a teenager, a permanent reminder of a loss too great for a young mother to bear. These visions keep her distant from her husband Dan, who is desperately trying to turn back time and rebuild the marriage that used to make him feel alive, and her daughter Natalie, who fears that she can never be enough for a family that can’t let go of the memories of their former son. 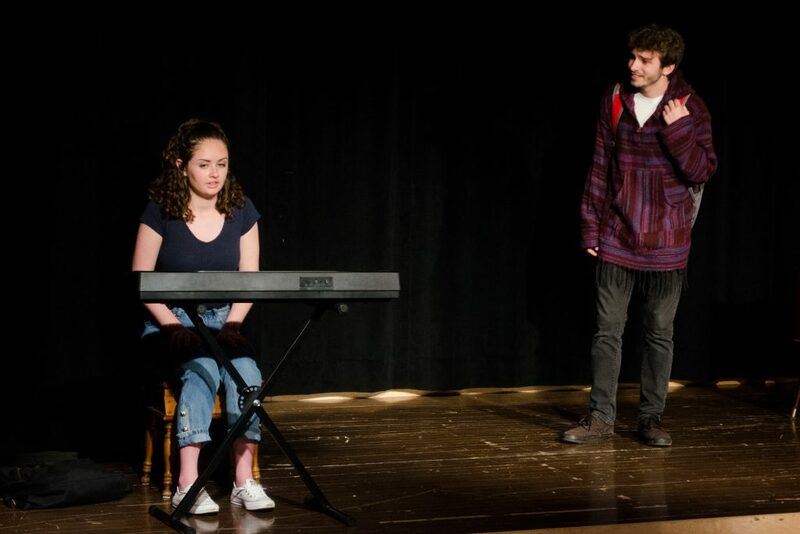 The rendition was directed by Mikayla Guida, a senior majoring in English. She discussed how “Next to Normal” took her and DCP out of their comfort zones and forced them to confront new challenges. The show is not afraid to mix tragedy with humor, but it never allows the topics to be mere punchlines. A parody of “My Favorite Things” from “The Sound of Music,” with all of the happy thoughts replaced with the names of antidepressants, may put a smile on your face, but the joke can only be funny with an understanding of the feeling of hopelessness that comes from endlessly trading one drug for another, always hoping that the side effects will not be worse than the symptoms. This may be a joke to the audience, but to Diana, it defines her daily life as well as the lives of her family. While discussing her directorial process, Guida stressed the fact that a show with such raw emotion and authenticity required a cast that was able to be vulnerable with one another, and discussed the need to build chemistry and trust between them. Twenty-five percent of the proceeds from “Next to Normal” will be donated to the Mental Health Association of the Southern Tier (MHAST), a nonprofit organization that aims to assist the local community in caring for mental illness and is the oldest continuously operating Mental Health Association in New York. Services include short-term crisis housing as an alternative to hospitalization and support groups to prevent struggling individuals from feeling isolated. Guida said she is glad to have the opportunity to support an organization that helps people going through the same issues that define the show. “MHAST, their work is so important and so to give back to that when we can and when we have the ability to is so important,” Guida said. According to Guida, the show’s main message is the idea that trying to be the perfect support system for someone you love can lead only to failure, at the expense of your own mental health. In order to give the best help you can, you need to take care of yourself first.